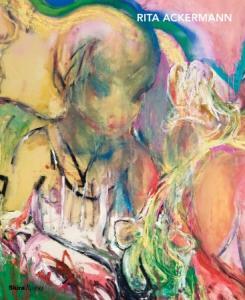 Rita Ackermann's new monograph, "Rita Ackermann" published by Rizzoli will be released on 11 October. This is the first major monograph on the artist and includes texts by Bonnie Clearwater, John Kelsey, Harmony Korine, Felix Ensslin and a forward by Josh Smith. A native of Hungary, Rita Ackermann (b.1969) moved to New York City in the mid-1990s. She arrived to find a culture (and art world) in transition: rave and zine culture was in full swing; collaborations between artists, musicians, and magazine and book publishers were pervasive; and the dawning of the Internet age was upon us. Within a few short months after settling in New York, the artist received widespread attention for her work, particularly a group of canvases populated with figures inspired by the cult German film We Children from Bahnhof Zoo about the heroin subculture of the 1970s. Her work forged a new visual language: paintings, drawings, and collages which telescoped between a virtuoso—and sometimes brutalistic—expressionism and taut, precise figurative drawing. Ackermann’s work explores the paradoxical relationship between fragility and violence, as she derives inspiration from literature, film, philosophy, and popular culture. This lavishly illustrated volume—created in close collaboration with the artist—chronicles the entirety of her career. Bonnie Clearwater connects the artist to Eastern European art historical precedents and examines the evolution in her practice over the last twenty years. Felix Ensslin thoughtfully examines Ackermann’s work through a panoply of European theorists’ writings, from Jacques Derrida to Jacques Lacan. Harmony Korine (famed writer of Kids) contributes an imagined conversation with the artist. John Kelsey explores the artist’s use of collage and its meaning in her body of work, and Josh Smith contributes a foreword, in the form of a personal letter.